What happens if you spin the Earth backwards? This might sound like a crazy idea, but bear with me. I mean, why not? We’ve got some pretty general computer models of the climate, all we have to do is change the sign of a couple of numbers. There are some legitimate scientific questions about how different aspects of our climate depend on their interaction with the Earth’s surface that we could use as “serious” motivation, but, if we’re honest, it’s mostly for fun. Because we can. Because we don’t know. It’s just a somewhat arbitrary sign on a parameter value, but it ought to make a big difference. What if…? So we did it*. As it happens, the meridional overturning circulation in the Atlantic ocean that helps keep Europe warm shut down, and the UK and Scandinavia cooled by about 10 degrees on the annual average. 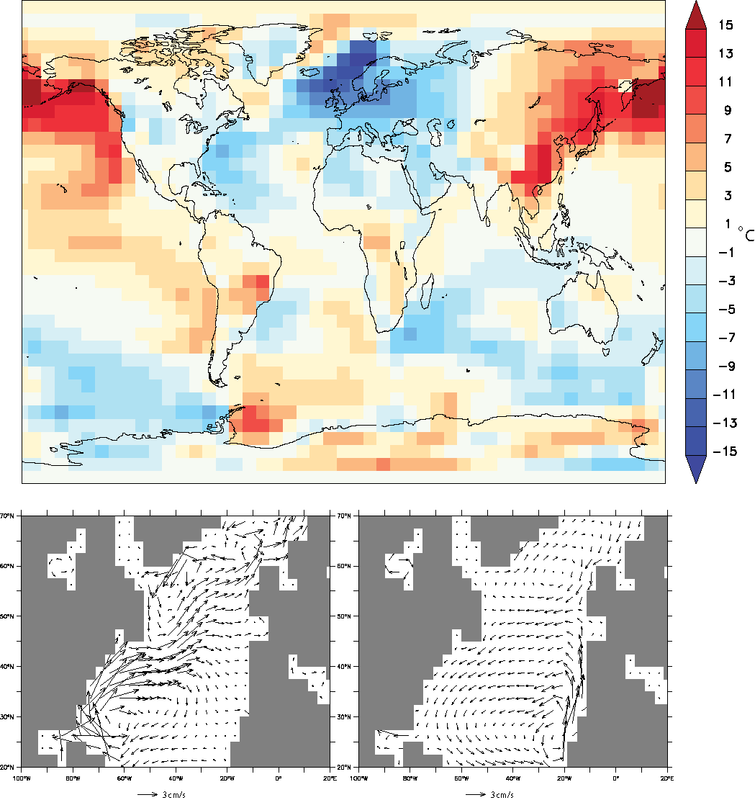 The ‘Gulf Stream’ no longer exists – there is now an eastern boundary current instead (see figure). North African rainfall went up, and the Mediterranean received so much river input it became almost fresh. The reorganisation of the world’s hydrological cycle that we initiated might have frozen Europe, but it started up a big, heat-transporting overturning in the Pacific instead, something that doesn’t exist in our world. Of course, that was just my model**. Someone else had the same idea, and got a different answer*** – different climate models don’t always agree, especially if you push them too far. So what’s the point? I find that these cartoon experiments generally elicit polarised opinions: some people think they’re fantastic, and launch into a stream of questions and speculations about what happens to their favourite bit of the climate. Others clearly think they’re a waste of time and effort. I think there’s real value in experiments like this though, however unrealistic the scenario and however wacky the results. You start thinking about the familiar mechanics of the climate system in a very different way from normal, and questions start occurring to you that you wouldn’t normally think to ask. They remind you that your model is just a model, and that maybe you should be thinking harder about what it’s telling you the rest of the time too, when you’re using it for more “serious” work. They’re fun, but also a great way of firing up your scientific instincts, of making you re-evaluate what you assume you know already about the world. What if…? Top: Annual average surface air temperature differences resulting from changing the direction of the Earth's rotation in the FAMOUS climate model. Bottom: Ocean currents in the top 500m of the Atlantic in FAMOUS. Left: normal rotation, with familiar gyres and North Atlantic drift; right: reversed rotation with backwards gyres and fast eastern boundary currents. I think cartoon experiments fantastic. I’m particularly interested in this retrograde rotation experiment as a way to evaluate GCMs. Structural uncertainty is a growing concern and the ability of GCMs to model major climate shifts is in doubt (http://www.nature.com/ngeo/journal/v4/n7/full/ngeo1200.html). Have GCMs simply been over fitted to 19th and 20th C. observations? It would be really great to see a retrograde rotation scenario included in future model inter-comparison projects. Take the 24 CMIP3 models are run them all backwards – if their general response to retrograde rotation is similar we gain confidence in the model physics/structure, if however there’s large deviation in the output we can conclude today’s GCMs (if right at all) are likely right for the wrong reasons, reducing our confidence in their future projections. Robin, are you considering widening this work to other models? What would be the problems? What do you think would happen to the thermohaline circulation if the Earth rotated in the opposite direction? Which would be climate changes on our planet? Investigating influences on the overturning circulation in the Atlantic (and what it takes to form one in the Pacific) was the original motivation behind these experiments, actually. As I note above, the Atlantic THC shut down in this reverse run, with a major cooling in Europe, and a compensating circulation starts up in the Pacific. There’s a few more details here in the poster I originally presented at EGU. You could also check out the Kamphuis paper referenced above to see what happened in their runs. A reverse-world MIP is an interesting idea – the trouble is that it’s a major change to the ocean dynamics, which can take many hundreds of years to get anywhere close to a new equilibrium. It’s pretty expensive to run most coupled GCMs for that length of time, if not practically impossible, and many would argue that a detailed scientific case for spending so much on doing it wouldn’t be very strong. I mentioned Kamphuis et al. – their results aren’t different from mine in every respect, so I think it would be wrong to conclude that we shouldn’t trust the models at all. The main “science” reason for doing the experiment has to do with testing theories as to why we have an overturning circulation in the Atlantic (AMOC) but not the Pacific, and this is where Kamphuis’s model and mine particularly differ. The AMOC is something we don’t understand terribly well though, and every model simulates it differently, so we’re talking about an area of science where we don’t really trust the models under any conditions – past, future or imaginary! I would like to second the idea of Chris, to make a multi-model experiment. Also in regional climate modelling, people have started running the models for other climates as the RCMs were developed for to study “transferability”. If you do this for just one model you do not learn much, but if you that all models perform just as well or not as well in “foreign” regions, you do get an idea of how robust and physical the models are and how much of the performance is tuning. Running the global models for all the different planets would be difficult and an inability to model methane precipitation no problem. Reversing the spinning direction of the Earth would be a simple experiment for global models that would give similar information. If we do so with a bit older (CMIP3) models, also the computational resources should be there. I love the idea of asking the “what if” question. As an example “what if the Isthmus of Panama had never emerged and the current between North and South America had remained in place. It’s a great way to temporarily destroy the usual view and encourage a rethink of the whole system. We always try to keep someone around that needs things explained, to ask the “dumb” questions. So I’ll step up. I have a curiosity question. It’s something I’ve been wondering about. I’ve been told that we were headed into what would have been the next glaciation cycle if we hadn’t started dragging sequestered carbon out of the ground and burning it. If the current Anthropogenic contribution to climate is overwhelming the input of orbital cycles, has anyone taken a look at what long term effects might be if elevated levels of carbon gases continues for 100,000 years? Longer? What else gets changed? I’m just curious if we have an idea of what LONG term effects human contributions to the climate cycles will yield, (if any). You mentioned you’ve seen other cartoons, have you seen this one? Hi Larry, thanks for the comment. “What would the climate system be doing without us?” is an interesting and pretty contentious issue, and the uncertainties surrounding the answer underline the fact that we really don’t understand the detailed timing and mechanisms behind glacial cycles well enough. Less computationally expensive models with carbon cycles do get run out for many thousands of years to see what happens to the anthropogenic carbon in the Earth System, but that’s mostly looking at things in terms of ocean uptake of carbon. If you stop pumping carbon into the atmosphere (and we’re going to run out of oil and coal at some point, there’s not an infinite stock of it) and wait long enough, atmospheric CO2 drops right down as the majority of the anthropogenic carbon gets absorbed by the ocean. And on even longer timescales, geology starts getting involved and we think the feedback processes present, like formation and weathering of sedimentary rocks, mean that the carbon cycle pretty much regulates itself, within certain limits. In terms of modelling the details of all this though, glacial cycles included, we’re butting up against the limits of what we can build models to do. You need a very different type of model to do the long-term geology compared to something that can interactively produce different weather, or something in the middle that can build a realistically responding ice-sheet. Getting all of these things to talk to each other, and to then run them together for long enough requires the sort of computing power that’s basically science fiction, I’d say. That’s even before we’ve tried to account for impossible things like life – the sort of biological, sociological or economic evolution that might well be major influences in the Earth System on those timescales, if you’re going to posit the existence of humanity that long! If you ran something like our current climate models with a constant, high CO2 for millennia, even including orbital changes and ice sheets I think it would probably be pretty boring – warmer, a more active hydrological cycle and higher sea-level. But I suspect that’s more to do with the limitations of the models (current climate models can’t even start a glaciation, the sort of thing that we know happened many times, without a lot of help) than a reflection of what might really happen. Maybe that’s one cartoon that’s better done in your head than in a computer. Hmm…. not sure you spun it backwards for quite long enough to be properly meaningful. In the long term, is it not the Corriolis forces on plate tectonics that really matter for circulation in the North Atlantic (or whatever it would have become)? Can you wind the simulation back to Pangaea and run it again, please? We don’t have plate tectonics in the model, or a whole load of other parts of the Earth system that are relevant for working out what the planet would really look like if it was all spinning the other way – the above is strictly an artifical cartoon. I’m not a geologist – someone do me some maps of a reverse-spun formed Earth and I’ll make you a climate! I like questions like this. You have focused on the change in ocean circulation, which is doubtless important. However, I know that people also mention the jet position as being important for the warmth of northern Europe, since warmer air is often carried northeastward from the subtropics. Part of this jet orientation seems to be forced by stationary waves, for instance over the Rocky Mountains. Also, prevailing winds coming from over an ocean are generally warmer than those coming from a continent in winter, so the reversal of prevailing winter winds should also cool northern Europe (the warming in Eastern Asia must relate at least partly to this, although there is not much cooling in the northwestern North America). It would be interesting to break down these different sources of temperature change a bit. You could, for instance, hold SSTs fixed to our current climate or do something to control the ocean circulation. At any rate, it would be cool to see a plot of the winds. The experiment was specifically set up to look at what it did to the ocean, which is the reason for the focus, but sure, loads of other cool things happen. 10m winds (guess which panel is which!) are the only things I can quickly find – I recall doing a quick bit of North Atlantic storm-track analysis at the time though, and it wasn’t as different as I was expecting (except for going the other way, of course), given the orographic changes up-stream. We did a small stack of these experiments, using flux adjustments to try to isolate the influence of the spin reversal on the heat, water or momentum fluxes to the ocean. I didn’t have much time for analysis in the end, and I never found a clear picture of what was going on – everything was a little bit of this and a little bit of that. You mentioned that on your home page [which I haven’t located..] you investigate aquaworlds. It’s something that’s interested me for a number of years – could you direct me either to your own work on the topic or any other investigations? Particularly to suggestions that a watery world was a state the early world passed through prior to crustal cooling. there’s a link to the WaterWorld stuff from my homepage (or you could download my non-typeset pre-print), but it’s done in a similar spirit to the reverse world experiment above rather than as geologically relevant reconstruction. It’s not an area I’ve really kept up with, but I know John Marshall and Daniel Enderton at MIT were doing some similar experiments at the same time as me. Possibly more relevant, I had an email from Hendrik Kienert (working with Georg Feulner) at PIK a while back who said he was interested in the aquaplanet in the context of Archaen climates, so you may want to look them up. Many thanks – most helpful. Though I’m not sure the ocean currents changed directions in the ice ages! For sure but curious all the same. What interest me is how would it affect tides? Would they last as long as they normally do? Gotta love those East Siberian temperate rainforests!